Home theater has been a major hobby of mine since the early 1990s when I hooked my first stereo VCR up to a 2-channel receiver. In college, my roommate start his co-op job and purchased at 20″ TV — my experience was as complete, or so I thought. A couple of years later, Dolby Pro-Logic receivers became available, and I upgraded to 5.1 sound. 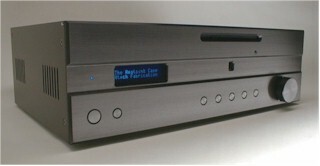 The addition of a DVD player shortly after they were introduced made a significant impact on sound and picture quality. 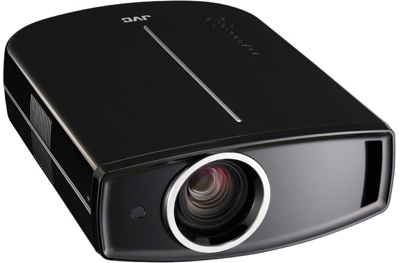 My next phase was acquiring one of the first 720p 16:9 projectors to be released, which replicated the big theater experience for the first time. The next major revolution was add HD capabilities with a TiVo HD Satellite receiver. Next came the addition of a Blu-ray player and a 1080p projector. I can’t wait to see what further improvements will come my way and fight my resistance to upgrades. . . I use My Movies Collection Management to catalog my movie collection and I have it published and viewable online. The fiberglass acoustic panel room treatment was by far the single largest contributor to audio quality. DVR and Movie Playback: Sage TV HD300; SageTV Server running on a Windows Home Server 2011 computer (in another room), Silicon Dust HD HomeRun Over-the-Air TV Tuners. Pre-Amp Processor: Anthem Statement D2 Preamp Processor with Room Correction, HD video switching and processing. 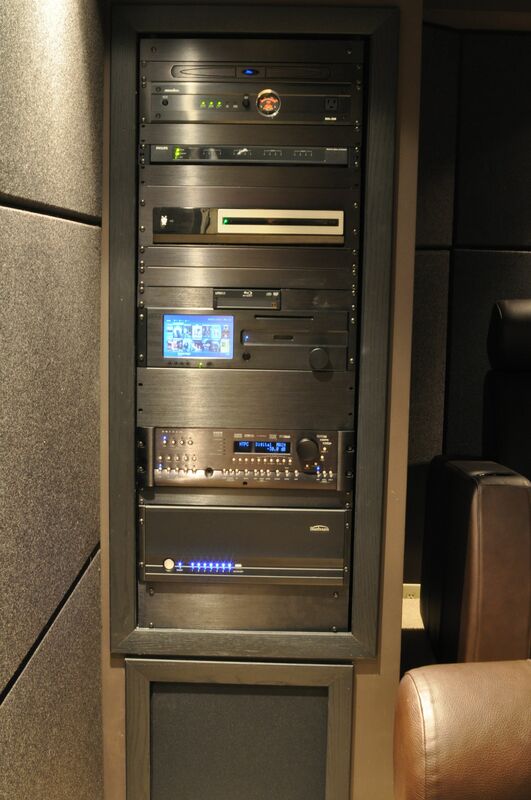 The Anthem Room Correction produces some of the highest audio quality available. Unfortunately, it is sometimes a little finicky when it comes to HDMI synching, occasionally requiring a flip off/on when switching between inputs. Amplifier: Sherbourn 72100A 7-channel amplifier. The Sherbourn 7/2100A does everything I need an amp to do: deliver lots of clean, undistorted power. Pure audiophiles say that the amplifier makes a huge difference in sound quality, but it’s my opinion that it has the least effect of any component in a system. This amp delivers 7-channels at a max of 300 watts each, which is more than my home theater requires. It accepts balanced inputs (XLR connectors) from my Anthem pre-amp and turns on and off automatically. Nothing more, nothing less, and all I need, and maybe then some. I purchased mine from Steve at SoundVideo.com. I currently use a combination of Windows 7 Media Center and the to browse and play my movie collection from any HTPC. I currently use Windows 7 Media Center and the Media Browser plugin and sometimes the MyMovies plugin to browse and play my movie collection. I use Windows Home Server to store all of my movie backups; Slysoft AnyDVD HD is used in the backup process. MyMovies Collection Management for Windows Home Server is used to provide the movie descriptions, cover art, actor profiles, etc., for all of my DVD and Blu-ray backups. 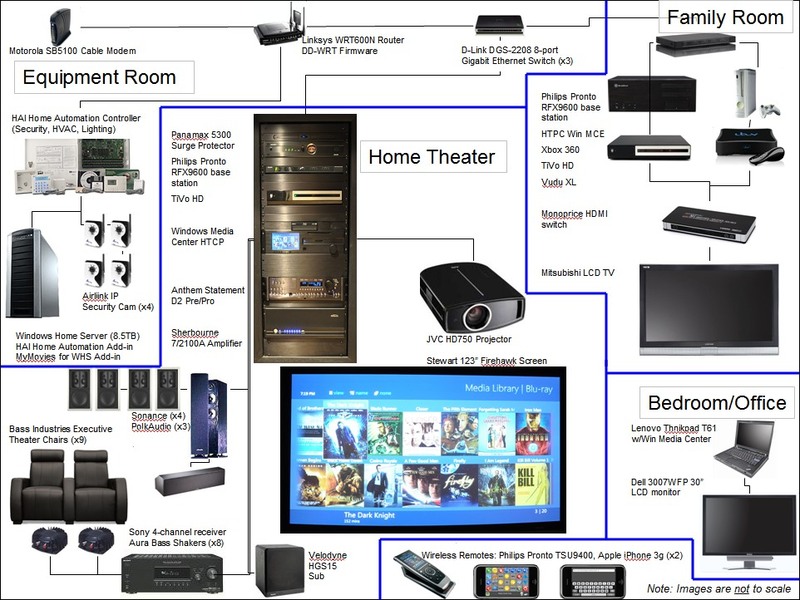 HTPC History: I’ve been a Home Theater Person Computer (HTPC) enthusiast since about 2000, when I borrowed a VGA projector to display movies on the wall but found the lack of a line-doubler intolerable. So I used PowerDVD to play the movie and purchased a high-end (for the time) sound card to output Dobly Digital audio. I later tried XLobby v2 (by Steven Hanna) as a movie browser interface, in hopes of replicating the $40,000 Kaleidescape system I’d seen demoed at the CEDIA home theater trade show. I also tried TheaterTek DVD player software. When Media Center Edition of Windows XP was released, it became my primary platform. Hi Dennis. Sounds like an awesome setup. I don’t have any direct experience with SVS SB13 subs, but I have with other (lower) models and they were awesome. I think you will be very happy with 2 SB13s. Good luck finishing your build! why aren’t your new subwoofers listed? Hi, sweet site love all the ideas! i have a question is 100inch screen to larger for a 16 1/2ft long 11ft wide? No, it’s not too big. This seems about right. 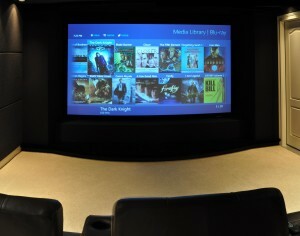 I’m getting ready to install a home theater in a new construction basement. I love how your equipment is organized. Could you point me to the type of racking that you have? 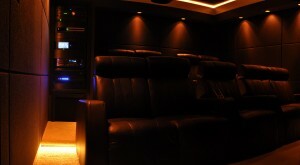 First of all I have to say that’s a awesome home cinema. I am interested in one to make so, I was checking your list and googling it where can I get the stuff half the stuff from the list is discontinued from the manufacture. Is it possible for you if you can update this list with the best products in available in the marker and roughly how much it’s cost. Akash, I’ll try to update this page at some point, but my suggestion is that you start with the Gear page for now. It’s 13 feet wide by 22 feet deep. The ceiling is 8 feet high at the highest point. I can get a used by in great shape JVC DLA-HD750 for $1500. Is that going to still be good, or have other projectors improved enough that I could get the same quality at a lower price new ? What is the difference between a D-ILA and a DLA ? Thanks for all of your research and sharing. Lance, I still have my HD750 and haven’t found a compelling reason to upgrade. The newer JCV projectors have slightly better native contrast ratios, and a gimmicky pixel shift faux 4k mode, neither of which are astronomical jumps forward. Thanks Carlton, that makes me feel better. I ended up buying it for $800. I think I got a bargain. I may be looking to you for configuration down the road. Thanks again for all of your research and calculation spreads. i have to know what is use of Sage TV? Hello Carlton, who do you recommend for home theater installation? Any company in Bay area which really can be trusted? Sorry, I don’t know the installers in that area. You’ll need to interview them and select the one that you think best matches your objectives. 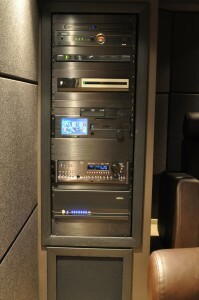 CEDIA is a good place to start to find well trained dealer and installers. Hi Carlton, your blog is great! I am in the midst of building my home theater, but kind of stuck with a 17′ by 16′ by 9′ height ceilings room. I am planning on using the Epson 5040UB. I did plan on putting a riser for the back seats that sticks out about 5′ therefore leaving around 12′ for the first row and the back row a little further back. My question is do you think a 120″ screen be to big? Should I just go with a 110″? Thanks! I think 120-inches is perfect. I sit 11 feet from a 123-inch screen. What is the weight of your theater??? Hey Carlton, great blog and VERY informative! 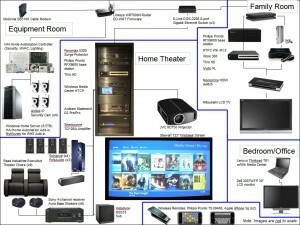 Probably one of the better blogs on home theater design. Quick question for you. I am very interested in creating a screen enclosure like the one you have pictured here, as my screen is also 123″. Do you have the specs on how you built it? It looks like it is covered in similar fabric covering as your panels, but black, right? Is the enclosure hollow? Thanks! The enclosures beside and below the screen are hollow frames made out of 2×4 pieces of lumber. The edges of the frames were rounded using a router and then painted black and covered with black speaker cloth. There is a separate frame covering the center, left, and right speakers. Each frame has 2 sides/faces, with the other 6 “sides” bring against the walls, floor and ceiling. Otherwise, too much light will show through the speaker cloth and you can see inside. Thank you for your reply, Carlton. So you actually built your speakers (left, right, and center) into the frame? Interesting. Additionally, I’ve always read that you want to make sure the wall behind your screen is completely sound proof. Wouldn’t having hollow frames around the screen impact the overall sound in your theater? Would an option be to build the frame as you have done with the speakers built in, but perhaps fill the frame with insulation? Thanks again for your time! I wouldn’t describe it as the speakers being built into the frame. The frames are 98% air. The frames are basically acoustically-transparent speaker cloth being held up in front of / beside the speaker. Because it’s acoustically-transparent material, it has virtually no effect on speaker performance (just like a speaker grill covered in grill cloth). The front wall of the theater (behind the front speakers) is covered in sound absorption insulation. You wouldn’t want to surround speakers or fill the frame in that material. The speakers need some free space around them. The acoustic treatments should only be on the wall behind the front speakers. Hi Carlton. Your blog is great! I find myself coming back to it quite often to reference during my home theater project. One quick question. What did you do for ventilation? Josh, for my home theater, I added a flexible supply line feeding 2 vents in the theater room. This is in addition to the one vent that was already there. For the return, I installed a silent bathroom exhaust fan in the equipment rack closet that vents to the room outside. This helps move air through the room, and hot air out of the closet. This in addition to the one return already in the room.